Second in importance only to the headline, this conversion element has the power to convince or confuse prospects in those crucial seconds before a purchase. 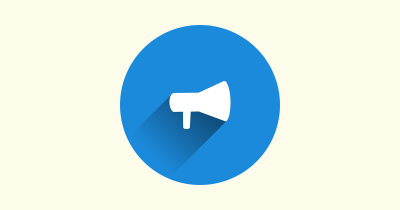 I am talking, of course, about CTAs (calls to action). Whether increasing your list or making a sale, the aim of your CTA is the same, to get your prospects to the next stage in your funnel. It’s an important job and one that deserves a good deal of attention, so why is it often overlooked? Ask yourself how many times you’ve seen some great copy that was undone by a lackluster, generic and uninspired CTA. It’s the tipping point between conversion and bounce, so you owe it to yourself to make sure your CTA is as compelling and successful as possible. So let’s try to put a stop to crappy CTAs and squeeze every last conversion we can out of your prospects by adding a more value at this important stage of your sales pitch. Sign up here (it’s free!). 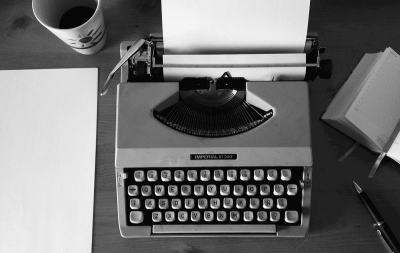 Keep reading for advanced CTA tips, plus a few challenges to accepted CTA rules of thumb. 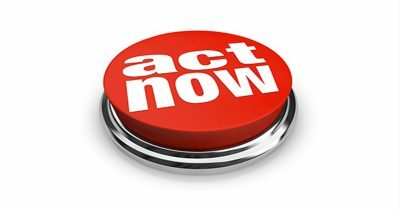 Don’t Create a Call to Action! Part of the problem with poor CTAs actually stems from the name. I see a lot of CTAs using language that simply describes the action you’re about to undertake. The problem with this language is that it’s often associated with effort or loss. No one wants to think about what a click will cost them. They want to think about what they’re going to gain. If your audience can’t see the gain of clicking, optimizing your CTA colors and positioning is all for naught. Take these three common CTA texts as an example. Submit – Simply a poor word choice. Of course, I know they want me to submit my details, but the word sends the wrong message. It’s vague, generic and makes me feel like I’ve lost a battle by submitting to your weak marketing attempt. Buy – You know what I associate with buying? Losing money. I might be getting something I want out of the purchase but reminding me that I have to pay for it makes me hesitate and question my decision. Order – Again, this reminds me that I’m having to purchase something. Not only that, having to order makes me think I’m going to have to wait for it. I’m impatient and want my product NOW! Instead of creating a call to action, create a call to value. Don’t focus on the word that best describes what a prospect has to do, use words that describe the benefit of taking the next step along your funnel. Make the value of clicking outweigh the cost. Test your ideas. You don’t have to make a major change. Michael Aagaard switched the word ‘order’ to ‘get’ for a Danish website and saw a 38.26% increase in conversions. Changing the wording from the negative ‘order’ to the benefit implying ‘get’ is a tiny change that had a huge effect on the effectiveness of the CTA. If you’re looking for further examples of good CTAs, look no further than two inches to the right. There’s no ambiguity or confusion in the Crazy Egg CTA. You’re told exactly what you’re going to get and how to get it. The focus is on what you’re going to receive, not what you have to do. See, that’s the thing with awesome CTAs. They don’t try to be clever or witty because they don’t need to be. They’re simple, to-the-point and focus on providing what the customer wants. It’s not hard set of rules to follow and, despite the other areas we’re about to get onto being important, I honestly think the tone and focus of your CTA text is the most important. So We Know What to Say, but Where do We Say it? I get it. It’s one of those marketing myths that has somehow become a rule of thumb. Unfortunately, I’s not a rule I subscribe to. 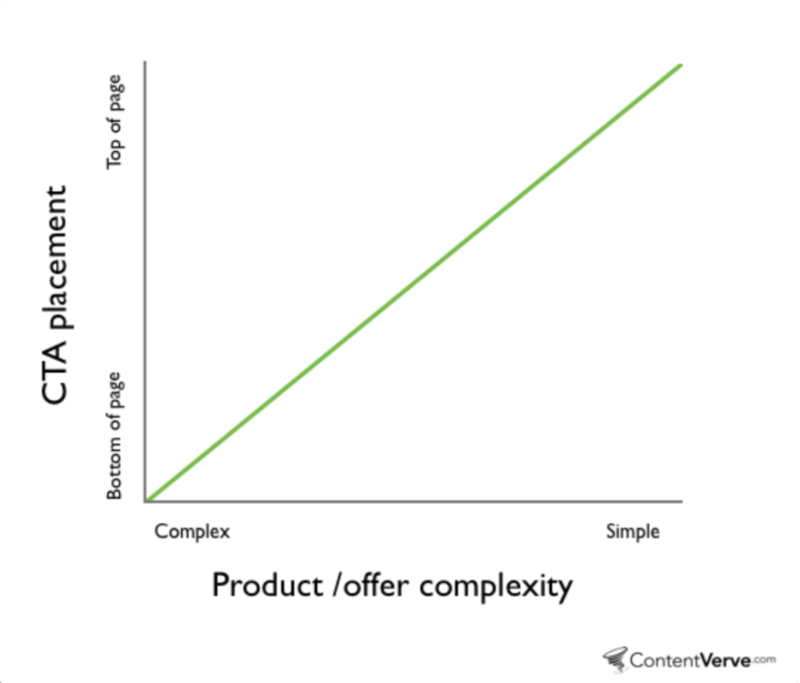 The best placement for a CTA isn’t at the top of your page. It’s not even at the the bottom of the page. The best placement is wherever your audience is ready to make the commitment. There’s a funnel, of sorts, leading up to the actual click. You need to get your audience to move through the stages of Attention, Interest, Desire and Action (AIDA) before they’re likely to click. A car salesman wouldn’t force you to make a purchase the second you stepped on his lot. He’d build your interest and desire before doing so because he knows you’re more likely to say yes. Getting someone to click your CTA is much the same. Your audience needs motivation and a reason to click before you can successfully ask for a purchase. Now I know what you’re thinking. You’re going to quote one of the derivatives of the old 80/20 rule, perhaps the one that says 80% of your audience won’t scroll to see more of your content. “On the average, five times as many people read the headline as read the body copy.” And not much has changed. But that ’s related to impressions, not conversions. The problem with CTA placement is there really is no hard and fast rule. 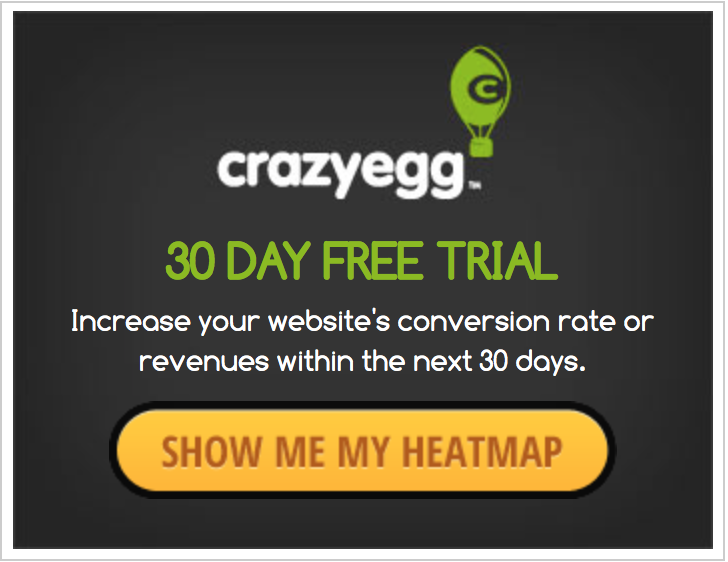 Take a look at the below example from KISSmetrics. 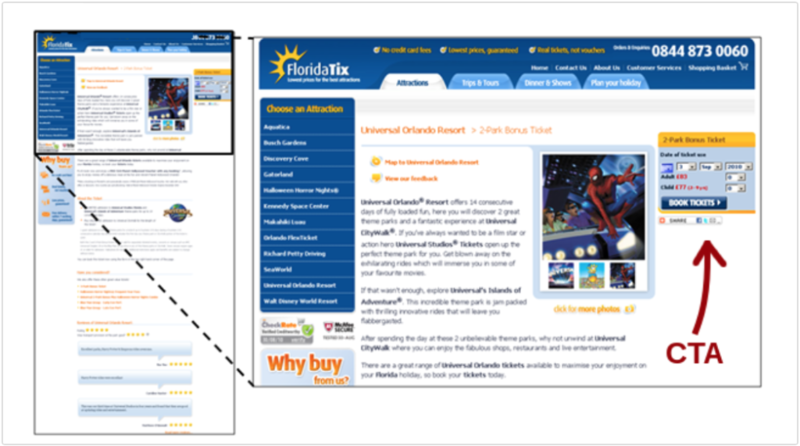 Same site, same copy, but one CTA outperformed the other by 20%. Which one? The one below the fold. So that’s one example of below-the-fold placement working better than the widely lauded above-the-fold placement, but I’m not saying that you should avoid above-the-fold CTAs. Take this study by Marketing Experiments, for example. 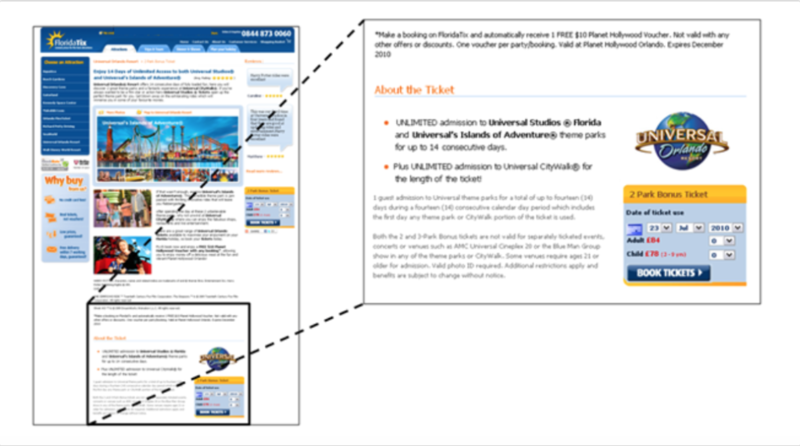 After testing an CTAs above and below the fold, neither outperformed the other. There was no discernible difference between the two. It turns out that the Boston Globe audience was motivated enough to convert regardless of CTA position. If only we all had such motivated audiences! The truth is there are no hard and fast rules for the perfect CTA placement. It depends on your content, your audience and the perceived cost-to-value ratio of your click. Wait. That’s a little too vague. Let’s go back to our original discussion on the cost to value of a click. If you want someone to click, you need the value to outweigh the cost. How easy is it to convey value in two to five words on your button? So how can the placement of your CTA help to demonstrate the value of clicking through? 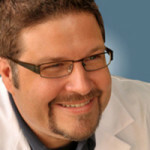 Michael Aagaard believes that the complexity of your offer should help dictate the positioning. The less complicated the product the easier it is to demonstrate value so you can place it higher on the page. It’s a great starting point. If you’re looking to optimize your initial landing page or main site pop-up then yes, look at the complexity of the offer. However, there’s a little more to it than that. Think about where customers are in your sales funnel and how motivated they are. Think back to our wonderful car salesman. He knows pressuring someone who isn’t ready to purchase will lose him a potential sale. On your initial landing page, your prospect probably knows very little about you, so you’re going to need to run through the whole AIDA sequence before asking them to sign up. If a prospect has come through a multi-stage marketing plan to get to your CTA, they should (if you’re doing it right!) arrive pre-sold on the idea, allowing you to place your CTA higher up the page. You’ve already done the hard work of creating and demonstrating value, so CTA placement becomes less important. As I always say, there’s no one rule for any conversion tactic to work. You’ve got to figure out what’s best for your audience and keep on testing. Figure out exactly when your prospects are ready to click and commit for the best conversions. One of the most hotly debated CTA topics pertains to color. Whilst I tend not to worry over CTA color, I have noticed a rather peculiar trend on many large sites. It’s a trend that Unbounce noticed and proclaimed to be the future of CTAs: the B.O.B or big orange button. I quite like orange, both the fruit and the color, but I wouldn’t say it’s the go-to solution for all businesses. I understand that a lot of large retailers prefer the color and I’ve screen captured a few below (a prize to the first person who correctly identifies every button! ), but that doesn’t make it the best overall choice. If you’re really stuck and don’t know where to go with your buttons, then orange probably is a good place to start, but that’s all it is. A starting point. Color might affect the result of your testing, and there’s plenty of psychological background behind the meanings and implications of various colors of your site. But an increase in conversions doesn’t come from understanding and exploiting psychological theory. They come from testing. Sure a lot of the big names use orange, and I’m willing to bet they’ve tested the crap out of their CTAs before settling on the color. Doesn’t mean it’s going to work for you though. Blue might tie in better with your overall brand and message, or you could play around with colors and see no discernible change. Orange isn’t the future of CTAs and increased conversions. Test your colors to find what works best. The only rule I’d reiterate is this: Make your CTA stand out with a complimentary yet different color to its surroundings. (Use a service like Adobe Color to find good combos.) After all, a CTA that would outlast Waldo in a hide-and-seek game isn’t going to help anyone. Do you believe everything you read online? No? Good. You shouldn’t, CRO articles are no different and should be taken with a liberal pinch of salt. Changing the color or location of a CTA might increase the clickthrough rate by 38% for marketer Joe, but did his actual sales increase? There’s a huge difference between a click and a purchase. We’re rarely presented with a full set of stats and information. For all you know, marketer Joe changed 8 elements on his landing page but only decided to monitor CTR increase. He puts the increase down to the inclusion of a wonderful BOB, but it could well have been any one of the other elements that helped out. You’ll also never find out how his increased CTR affected his overall sales. Basically I just want everyone to be far more skeptical. Partly so I can be part of the crowd, partly because there are a lot of mistakes made when running tests. Read what others are doing, but don’t take it as gospel. Take the information, try it for yourself and make up your own mind. For all you know, marketer Joe is a charlatan and a fool. So how’re your CTAs converting? Do you feel that outweighing the cost with value is the way to go or have I committed blasphemy by defaming the much-used BOB?